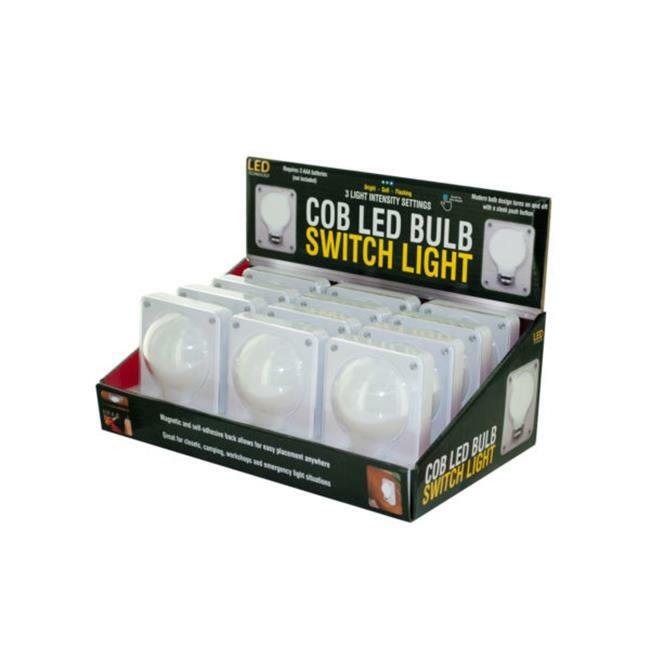 Great for closets, camping, workshops and emergency light situations, this COB LED Bulb Switch Light features a durable plastic modern bulb design that turns on and off with a sleek push button. Compact size can be taken anywhere light may be needed. Magnetic and self-adhesive back allows for easy placement anywhere. Light has 3 intensity settings bright, soft and flashing 3 watt power 150 lumens. Requires 3 batteries not included. Light measures approximately 3.25 x 4.25. Countertop display comes with 12 pieces.